NEW YORK (Reuters) - Puerto Rico’s federal oversight board on Thursday approved a fiscal turnaround plan that includes pension cuts and labor reforms that Governor Ricardo Rossello has vowed to defy, portending the latest potential court battle over the bankrupt U.S. territory’s future. At a hearing in San Juan, broadcast via the internet, the seven-member board voted 6-1 to certify a plan that forecasts $6.7 billion in debt payment ability for Puerto Rico through 2023. Board member Ana Matosantos was the lone dissenter. Tasked with helping Puerto Rico recover from the dual scourges of fiscal insolvency and natural disaster, the board green-lighted its plan after unsuccessful negotiations with Rossello on a consensual framework. The governor has opposed labor and pension reforms, insisting the board lacks the authority to impose steps that would require legislation. If Puerto Rican leaders refuse to implement such measures, the board could sue to enforce them, sparking more litigation over the details of Puerto Rico’s path to solvency. The island’s bankruptcy has already seen months of costly litigation among stakeholders competing for the island’s limited resources. Puerto Rico filed the biggest government bankruptcy in U.S. history last year, owing $71.5 billion of bonds and $50 billion in pension obligations. It then suffered catastrophic damage from September’s Hurricane Maria. “We will not propose any bill that reduces vacation and/or sick leave,” Rossello said in a written statement on Thursday, adding that it was “wrong and immoral to reduce the benefits” of public worker pensions. The board’s plan would slash pensions 10 percent on average, though specific cuts would vary according to income. With pensions virtually insolvent, current benefits could cost more than $1 billion a year from the island’s general fund. “The reality is that the employment retirement system is less than 1 percent funded, which means the pensions that people expect ... could not be paid without these reforms,” Natalie Jaresko, the board’s executive director, said at the hearing. The board’s plan would loosen private-sector job security that is stronger than almost any U.S. state’s, eliminate mandatory Christmas bonuses, and halve paid leave. It also calls for headcount reductions, putting layoffs on the table if targets cannot be achieved through attrition. Puerto Rico’s benchmark general obligation bond traded at 42.6 cents on the dollar on Thursday, while senior sales tax-backed debt traded at about 60 cents, according to Thomson Reuters data. The board also approved turnaround plans on Thursday for Puerto Rico’s beleaguered power authority, PREPA, and water authority PRASA. punch. Many homes are still without power, and the system’s future is far from certain. YABUCOA, P.R. — Rafael Surillo Ruiz was on the way to San Juan when he noticed that all the traffic lights had gone out. Mr. Surillo is the mayor of Yabucoa, among the first communities struck by Hurricane Maria last September, and for months he had been lobbying federal officials, local officials, utility officials — anyone who might help the thousands of his constituents still waiting to get their power back. Now, as he headed north for yet another meeting, the phone calls from home confirmed the worst: Not only was his city of spiky mountains, lush green marshes and rugged coastline totally powerless again; the entire island was blacked out. It was a rudely inauspicious omen, even for a man sunk seven months deep in frustration and disbelief. After Maria and the hurricane that preceded it, called Irma, Puerto Rico all but slipped from the modern era. Even now, while officials say the $2.5 billion reconstruction effort has restored power to 98 percent of the grid’s customers, swaths of hilly country across the island are still pitch black after dark, punctuated by lights run on private generators. (About 60 percent of Yabucoa’s residents had power as of May 1.) Even restored sections of the grid are nightmarishly unreliable, as evidenced by last month’s outage, the second major power failure in a week and the fourth since early February. Yasmin Morales Torres standing in what was left of a relative’s home in Yabucoa. In the storms’ devastation, the island all but slipped from the modern era. On the mainland, much of the coverage of the recovery has focused on the struggles of the island’s beleaguered power authority and its politically disastrous hiring of Whitefish Energy Holdings, a tiny and inexperienced Montana contractor linked to the Trump administration’s interior secretary. Here in Puerto Rico, the perception of a condescending and under-responsive government in Washington has been fed by the enduring image of President Trump seeming to minimize the catastrophe while tossing paper towels into a crowd. But an examination of the power grid’s reconstruction — based on a review of hundreds of documents and interviews with dozens of public officials, utility experts and citizens across the island — shows how a series of decisions by federal and Puerto Rican authorities together sent the effort reeling on a course that would take months to correct. The human and economic damage wrought by all that time without power may be irreparable. When the Puerto Rico Electric Power Authority, known as Prepa, hired Whitefish for the reconstruction, it also declined to request direct assistance from mainland utilities that for decades had routinely dispatched workers to help one another recover from disasters large and small. At the same time, the Federal Emergency Management Agency made a highly unusual decision of its own. Rather than advise Puerto Rico to accept aid from the mainland utilities, FEMA abruptly called in the Army Corps of Engineers — never mind that the corps had never rebuilt a major grid after a storm and by its own account had not made preparations to take on the task in Puerto Rico. The result was a chaotic tangle of overlapping missions and fumbling coordination. Compounding those problems, the grid was decrepit, corroded and poorly maintained, and Prepa — which, like Puerto Rico as a whole, is effectively bankrupt — had failed to keep sufficient stocks of replacement parts and other critical supplies. Shipments of parts from the mainland were slow to arrive and languished in the battered ports. The terrain is so forbidding that replacing a single power pole can require a helicopter and a team of line workers. The effort seemed to go impossibly awry. Many experts and public officials have also lamented the decision, largely driven by federal disaster-assistance law, to rebuild a poorly designed grid almost exactly as it was. “The system that we have up now in Puerto Rico is vulnerable to a hurricane, and it’s going to happen again,” said Rolando Ortiz Velázquez, the mayor of Cayey and head of the Mayors Association of Puerto Rico. Palo Seco is a major power plant in the San Juan area. Like much of the electrical system, it is in a state of disrepair. It took more than a month for Prepa’s decision on aid from utilities, known as mutual assistance, to be undone. In late October, with the reconstruction seemingly stalled, Gov. Ricardo A. Rosselló of Puerto Rico met with Gov. Andrew M. Cuomo of New York, a veteran of Hurricane Sandy and other natural disasters. Mr. Cuomo strongly recommended invoking mutual aid. Weeks more would pass before the full mobilization got underway, but beginning in November, the first of some 3,000 utility workers from across the country began pouring in. The first wave had a distinctly New York flavor — San Juan streets filling with trucks and workers bearing the insignia of Con Edison, the New York Power Authority and other organizations. Carlos D. Torres, Con Edison’s recently retired storm and emergency czar, became Mr. Rosselló’s choice to lead the restoration and reshape the effort. After the ferocity of Maria, there has been a whirlwind of blame cast among the parties involved. Pretty much everyone spoke of Maria’s awesome power and the extreme challenges posed by Puerto Rico’s precipitous landscape. For its part, FEMA said its effort had moved rapidly, though it conceded that the final pieces — the “last mile” — were especially challenging. To Mr. Torres, who speaks with the wisdom of many storms, the human forces at work in Maria’s wake were at least as daunting as the natural ones. As Maria approached before dawn last Sept. 20, Cecilio Ortiz Garcia had a premonition of what was to come. Dr. Ortiz is a professor at the University of Puerto Rico’s campus in Mayagüez, and for the last few years, he and his colleagues had been studying the long decline of Prepa and its electrical grid. “When Maria came,” Dr. Ortiz said, “she found a system that was already on its knees.” By 5 a.m., nearly every light on the island was out. The electrification of the entire island began only in the late 1800s, when sugar and tobacco barons began allowing local municipalities access to their power systems, Dr. Ortiz said. Luis Muñoz Marín, the activist who became the island’s first elected governor in 1948, built up the grid and made it the industrial pride of Puerto Rico. By the late 1950s, helicopters were ferrying power poles to the island’s remotest corners. The slide began with Mr. Muñoz’s defeat in 1968. Since then, Dr. Ortiz said, the island’s two pre-eminent political parties have made Prepa more a patronage bank than a center of technical excellence — a view shared by some who have grappled with Prepa from within. Juan F. Alicea Flores, a former director, recalled that whichever party was in power would hand over an organizational chart filled with politically connected people. “ ‘You are the leader, but the team is ours,’ they would say,” Mr. Alicea said, recalling the negotiations he endured. Prepa suffered another blow after building oil refineries and fossil fuel power plants, many on the southern coast — only to see the 1973 oil crisis pummel the island financially for making those bets. More recently, a series of poorly advised bond issues left the authority bankrupt, $9 billion in debt. Vines crawling up a transmission tower. The power grid has been in decline for decades, and much of the infrastructure is in hard-to-reach areas. As a result, the plants in the south have become what Dr. Ortiz called a “cemetery of rust.” Conducting wire carried by aging transmission towers must hopscotch forested mountain ranges to carry power to the densely populated San Juan area in the north. That leaves the towers, and therefore the entire system, extremely vulnerable to high winds. Performing inspections after Maria, utility experts observed what had become of Mr. Muñoz’s achievement. The “deadman anchors” — concrete-encased steel rods — attached to the guy lines holding up transmission towers had corroded, according to Jeffrey A. Miller, an engineer for the federal Energy Department. While other utilities that use those anchors have protocols for regular inspections and repair, Prepa did not, he said. “Given the age of the system as a whole, it’s not a stretch that that was a culprit in the majority of the transmission lines that fell,” Mr. Miller said, adding that the high winds were a factor as well. A recent tour of the major power plant in the San Juan area, Palo Seco, revealed a grimy, corroded mess, with grand old turbines opened up and rusting, like someone’s forgotten auto repair project on a front lawn. Local distribution systems were no better. Linemen found incomprehensible snarls of wiring and defunct equipment perched atop rotting wooden power poles. As unpredictable as major storms are, the utility industry has a standard bag of post-disaster tricks. Because every utility knows that it may need help next, there is seldom a problem mustering enough workers via mutual aid. Some 10,000 workers from 21 states traveled to Texas and Louisiana after Hurricane Harvey last summer, according to the Edison Electric Institute, an industry group. And after the one-two punch of Irma and Maria, the United States Virgin Islands took the standard step of bringing in a contractor and about 800 mainland utility workers. Indeed, a range of experts, including officials from the principal industry groups, said they could not recall an instance in recent decades of a utility failing to request mutual aid after a grid was knocked out in a major storm. In Puerto Rico, “mutual aid should have been one of the first things they did,” said James Lee Witt, who ran FEMA during the Clinton administration. How large was the task? Puerto Rico has 2,400 often mountainous miles of high-voltage transmission lines, 342 substations and 30,000 miles of lower-voltage distribution lines that go to neighborhoods and homes, according to Prepa. Maria damaged 80 percent of that system. But on Sept. 28, eight days after Maria made landfall, two parallel decisions drove the monumental rebuilding into uncharted territory. In a conference call with Prepa, government and utility officials delivered a collective offer of mutual aid: “We stand ready to help you,” they said, according to Mike Hyland, a senior vice president at the American Public Power Association, who was on the call. But the Prepa officials, he recalled, said they were hiring Whitefish to restore the entire system. Line workers from New York and Wisconsin utility companies gathered for a safety meeting at dawn in San Juan. At the same time, FEMA made its own request, enlisting the Army Corps to provide emergency repairs to the grid. FEMA had already given the corps a task it routinely performed: bringing in emergency generators for hospitals, clinics, town centers and other facilities. By all accounts, those measures were carried out successfully. But the corps “has never repaired an electrical power grid of this magnitude as part of a domestic disaster response,” said its commander, Lt. Gen. Todd T. Semonite. Although it had placed “a small contingent” in Puerto Rico before Maria to assess eventual damage, he added, the corps “could not predict” the assignment to restore the grid. The political brouhaha ignited by the Whitefish hiring vastly complicated matters. Initially, questions focused on Ryan Zinke, the interior secretary, whose hometown is Whitefish, Mont., where the company is based. Mr. Zinke and the company itself said he had nothing to do with awarding the contract, even though his son worked a summer job at Whitefish. Beyond questions about Whitefish’s capability, the uproar was magnified by the opaque wording of the $300 million contract, the size of the company’s markups and a Twitter threat to withdraw from San Juan after criticism by the mayor. Whitefish soon apologized. Ricardo Ramos, Prepa’s director at the time, has made a series of disparate statements about why the authority did not invoke mutual aid. “It was always my intention to call upon them,” Mr. Ramos said in a recent interview. A decades-old generator at Palo Seco, a crucial station in the island’s power grid. But until they receive reimbursement from FEMA, utilities often must pay for things like workers’ food and housing via mutual aid. In October, Mr. Ramos told The New York Times that he had not wanted to exhaust Prepa’s emergency funds paying mutual-aid groups while waiting for reimbursement. (Mr. Trump had declared that FEMA would provide full reimbursement for emergency work in Puerto Rico. Whitefish, though, said it was not requiring payment up front.) Mr. Ramos also said that Prepa would have been hard-pressed to provide the workers with hotel rooms, food, fuel and other supplies. Mr. Ramos said he had no regrets. Mr. Roselló, however, acknowledged that his government had fallen short — that it should have had “some sort of agreements already in line,” as well as a “rainy-day fund” for mutual-aid payments. “That is one of those lessons learned,” he said. Whatever was or was not said and done, the overlapping duties, without the experienced utilities that had coordinated and carried them out through decades of storms, seemed to be a prescription for chaos. That, by many accounts, is exactly what followed. In practice, all the players answered to Prepa, according to Mr. Miller of the Energy Department. The lights of San Lorenzo can be seen from the hilltop home of Sylvia and Reggie Martínez. They have been living without power since Hurricane Irma. In the first days, as Prepa officials struggled in the mud and darkness to begin the journey back to a functioning grid, it turned out that the authority had not even stockpiled enough gasoline to see it through the emergency. For its part, the Army Corps moved as swiftly as federal regulations allowed, General Semonite said. But even after invoking emergency measures to speed the effort, he said, it was not until Oct. 19 that the corps awarded the second of two major restoration contracts. The contractors, in turn, had to scout the damage before work could begin. Mildoel Rodríguez, who is disabled, relied on candles to see in his home after dusk until power was restored last month. By February, crews with the corps’s main contractor, Fluor, had started returning home amid criticism in some quarters that the work had gone sluggishly. Fluor has defended its work. Mr. Rosselló said the corps’s bureaucracy was all but immovable in an emergency that demanded quick action. “They didn’t have a sense of urgency; there was always a bureaucratic excuse for one thing or another,” he said. In his communications with mayors, Mr. Torres, the retired storm czar who became the governor’s lieutenant, said delayed deliveries of millions of parts — the Pentagon’s responsibility — often slowed power restoration in those desperate communities. The work was further complicated by the strictures of federal law. The Stafford Act, which governs FEMA reimbursements, in most cases requires rebuilding to pre-disaster specifications. In Puerto Rico, that meant recreating electrical components that gave the impression of a time capsule from the 1950s and ’60s. In some cases, like an outmoded transmission cable called the Puerto Rican Special, the parts had to be rebuilt from scratch, Mr. Miller said. The sense of spinning in place was summed up by the experience of 20 workers from Lakeland, Fla., hired as subcontractors by Whitefish. The workers arrived expecting to pick up their trucks, which had left Florida 10 days earlier. “Every morning I waited for the call to pick up the trucks,” Charlie Russell, the Lakeland Electric supervisor on the ground, wrote to his bosses. A crew from Oklahoma Gas and Electric repairing a pole. Some 3,000 utility workers from across the country assisted in the restoration effort. He waited and waited. Puerto Rico’s damaged ports, shut down after the storm, were now jammed with a backlog of containers. Mr. Russell asked at his hotel for the location of Prepa’s offices, where he might get some answers. He set out on foot with a Spanish-speaking co-worker to a district office two miles away. They found it, but security guards would not let them in. They tried again the next day. Eventually he found a Prepa supervisor, but he had no tasks for the men. In the end, Lakeland Electric was in Puerto Rico for 22 days. The crew did repair work for two and a half. The bill, which taxpayers will probably foot: $820,271.25. As time slipped away, people settled into new routines without electricity. In the hills above downtown San Lorenzo, Sylvia Martínez woke at 3:30 a.m. every workday, heated water on the gas stove and carried it to her bathroom in a pot so she could shower — using a plastic cup — before her long commute to San Juan. She developed an affection for easy-to-make meals of Cheez Whiz and crackers. Mildoel Rodríguez, who is disabled, relied on candles to see as dusk settled in among the dizzyingly steep hills on the outskirts of Cayey. In Humacao in the east, Luz Rivera conducted Bible study classes with her friends by flashlight. Some who could afford it took to paying unauthorized workers to climb the poles, connect the lines and bring power to houses and neighborhoods. In San Juan, Alejandro Cubiñá paid a worker $500 to fix the lines powering his business, a tree nursery. “That’s the Macondo way,” Mr. Cubiñá said, referring to the hidden factors at work in the city of that name in “One Hundred Years of Solitude,” by Gabriel García Márquez. Mr. Ortiz, the Cayey mayor, began organizing unofficial workers, including former Prepa employees, to hook up his desperate city, but he ignored an unspoken Macondo rule: Rather than keep the work secret, he informed Prepa. The authority shut the effort down, citing safety issues, he said. It was against this backdrop of scant visible progress that Mr. Rosselló met with Mr. Cuomo in a back room at the San Juan convention center on Oct. 26, more than five weeks after the storm. Ms. Martínez lighting her stove at dusk. After the power went out, she began heating water on the stove so she could shower — using a plastic cup — before heading to work in the morning. Mr. Rosselló was accompanied by a handful of his top emergency officials; Mr. Cuomo had brought along two top aides and Gil C. Quiniones, chief executive of the New York Power Authority. Mr. Ramos was not there. The Puerto Rico governor expressed frustration and repeated what everyone knew: Despite a swarm of federal officials and contractors having arrived to help, power was still almost completely out across the island. In a recent interview, Mr. Cuomo — who is seeking a third term — deflected suggestions that his involvement in the recovery was meant to cultivate political capital. Rather, he said, he was motivated by cultural and personal connections with the large number of Puerto Rican New Yorkers. Even so, storms — or, more precisely, the way public officials deal with them — are unmistakably political, especially in New York, where the failure to clear city streets after a 1969 blizzard famously crashed Mayor John V. Lindsay’s rising political star. For his part, Mr. Cuomo has generally received far higher marks for his handling of Sandy and other storms. Mr. Cuomo pointed out in the interview that he and Mr. Rosselló shared a bond dating to an earlier storm: In his office, Mr. Cuomo keeps a picture of himself huddling in a shelter with Mr. Rosselló’s father, Pedro, then Puerto Rico’s governor, during Hurricane Georges in 1998, when Mr. Cuomo was federal housing secretary. Workers securing a pole that a helicopter lowered into place in the mountains of San Germán. Now Mr. Cuomo urged Mr. Rosselló and his colleagues to invoke mutual aid. For Mr. Rosselló, a professor of biomedical engineering who had taken office just a few months before, “this was a case of first impression,” Mr. Cuomo explained. Then, using Sandy as an example, Mr. Quiniones laid out how Long Island power officials had requested mutual aid and received nearly full reimbursement from FEMA for the immediate restoration. At that point, Mr. Quiniones said, Mr. Rosselló signed on. Not long after, Mr. Rosselló demanded Whitefish’s ouster and Prepa terminated the contract. Whitefish stayed to finish work that included repairing five transmission lines, which a company spokesman says was successfully done. Whitefish filed papers in federal court to recover more than $100 million that it said it was still owed. The black-and-yellow helicopter appeared over a ridge to the south. Beneath it was a 35-foot length of pine — a power pole — dangling from 100 feet of rope. The pilot, Andrew Chan, of Portland, Ore., flew northward along an ascending mountain valley toward a bare outcropping where utility workers were waiting next to a partly trampled barbed-wire fence, a downed power pole and a pink tin-roofed house. Julie Angulo Ramos, of San Juan, danced after her home got power in February. As she ran to switch on appliances, her friend pulled a string to turn the kitchen light on and off repeatedly. The steep gravel-and-concrete lane leading to the house in San Germán, in western Puerto Rico, was too treacherous for a heavy vehicle. Which was why Mr. Chan was lifting the load up the heavily forested valley and past the pink house, pivoting 180 degrees and slowly approaching the workers — their hard hats tilted upward, the aircraft bobbing and pitching slightly in the wind. Mr. Chan lowered the pole toward a hole in the dirt as Ron Overbye and Brock Stigall of Greensboro, N.C., yanked on guy lines until the pole was in place. Using a controller in his left hand, Mr. Chan disconnected the rope and flew southward again, disappearing over the ridge to pick up a second pole and then the conducting wire to string between them. In all, it would take 18 workers — from an Army Corps contractor called PowerSecure — a full week to light up about 30 houses in this unforgiving terrain, said Maj. Michael Meyer, a corps spokesman. And these were just two of over 41,000 power poles that the Army Corps says it has shipped, using the Pentagon’s Defense Logistics Agency, along with 4,545 miles of conducting cable and wire and 36 million repair parts. After Prepa’s request for mutual aid on Oct. 31, the various parties in the effort began trying to make up for lost time. Mr. Torres arrived in San Juan in early November and, working with Prepa and the Army Corps, set up a control room, placed management teams in seven regions of the island and unified the command structure. By Nov. 17, the New York contingent had begun powering up citizens in San Juan. (Mr. Ramos, under pressure over the Whitefish hiring, resigned that day.) By early January, after the mutual aid paperwork was ironed out, workers had arrived from Florida, Illinois, Kentucky, Maryland, Michigan, Ohio, Oklahoma, Texas, Wisconsin and elsewhere. Children celebrated after workers restored power to their school in San Juan. Still, the shadow of the Stafford Act hangs over the entire effort. In the work done so far, the new lines, like the old ones, will stand on exposed ridges to carry power over the mountains from south to north. Despite years of demands from environmental and industrial groups, new solar farms that would wean the island from fossil fuels and power more resilient local grids will remain largely unbuilt. The government’s bullish figures aside, how far along is the power restoration? With the continuing blackouts, and nearly 900 temporary generators still on the island, according to congressional testimony, it is hard to gauge the true state of the grid or how lasting the fixes will be. Mistakes by contractors overseen by Prepa have triggered the island-wide blackouts: a tree being cut down to clear the way fell into a live line, a conductor left dangling in the mountain wind shorted out and a piece of equipment too close to another line caused another short. In the fourth case, a component at the Monacillos substation in San Juan overloaded and caught fire. Because the system still lacks enough backup lines and generators, each fault shut down most of the grid. What is undeniable is that when utility trucks from the mainland finally arrive in a neighborhood, there is joy. In February, on Buenos Aires Street in San Juan, a crowd gathered at Julie Angulo Ramos’s home as a group of utility workers from WEC Energy Group in Wisconsin rounded the corner, ready to power the street. One of them, Josh Blankenberg, went up in a bucket and connected the leads at the top of a pole. The street lit up. People shouted, prayed, danced, whistled. “Thanks to God! Thanks to you!” Ms. Angulo shouted to the workers. For others, that moment took longer to arrive. Workers from Commonwealth Edison in Chicago hooked up the home of Mildoel Rodríguez, in Cayey, and the surrounding neighborhood during the first days of April. Others are still waiting. Ms. Rivera, in Humacao, does not have power and has heard nothing from Prepa or the local government. At 3:30 each workday, Mrs. Martínez wakes to prepare for her long commute to San Juan, on a route where many traffic lights lack power. She has taken to making easy meals of Cheez Whiz and crackers. And in San Lorenzo, after her breakfast of Cheez Whiz and coffee, Ms. Martínez still carries hot water from her stove to the shower in a three-gallon pot. Then she drives to work in the predawn, the Big Dipper visible in the sky above the dark hilltop. The Financial Oversight and Management Board for Puerto Rico said Sunday that it is amending the fiscal plan submitted by Gov. Ricardo Rossello, which the board has rejected. In their May 11 notice of violation to the governor, board officials said the government provided only a general fund budget instead of a complete budget, and the government's proposed budget "needs to go farther in providing transparency, fiscal management and enforcement tools." The board's changes are needed "to ensure timely implementation of critical structural reforms" that will also help restructure debt and resolve bankruptcy proceedings, a board statement said. The oversight board was given the authority to enforce a fiscal plan if the government refuses to cooperate, under 2016's Puerto Rico Oversight, Management and Economic Stability Act. Board Chairman Jose B. Carrion III said in the statement that the board's changes would reduce a projected annual surplus for fiscal year 2019 by only $101 million, with a six-year surplus of $6.05 billion total now projected. The plan for six fiscal years from 2018 through 2023 provides a framework for economic growth that would allow the government to fund pension payments and restructure Puerto Rico's debt. On pension reform, the plan calls for freezing pension benefit accruals by July 1, 2019, and enrolling all employees in defined contribution plans, as well as Social Security. Benefits would be reduced progressively to an average cut of 10%, with no cuts for participants whose combined pension and Social Security benefits are below the poverty level of $1,000 per month. The board has reached an understanding with the government on some economic development measures, including labor reforms, but not the pension changes. "The board's policy on pension reform remains unchanged, and we expected it to be included in the plan of adjustment to be confirmed by the court. As per the new certified fiscal plan, the reform is reflected in calculation of pension expenses in FY20," said Natalie Jaresko, board executive director, in an email. Along with recertifying the amended fiscal plan soon, the board will increase monitoring to ensure timely implementation. 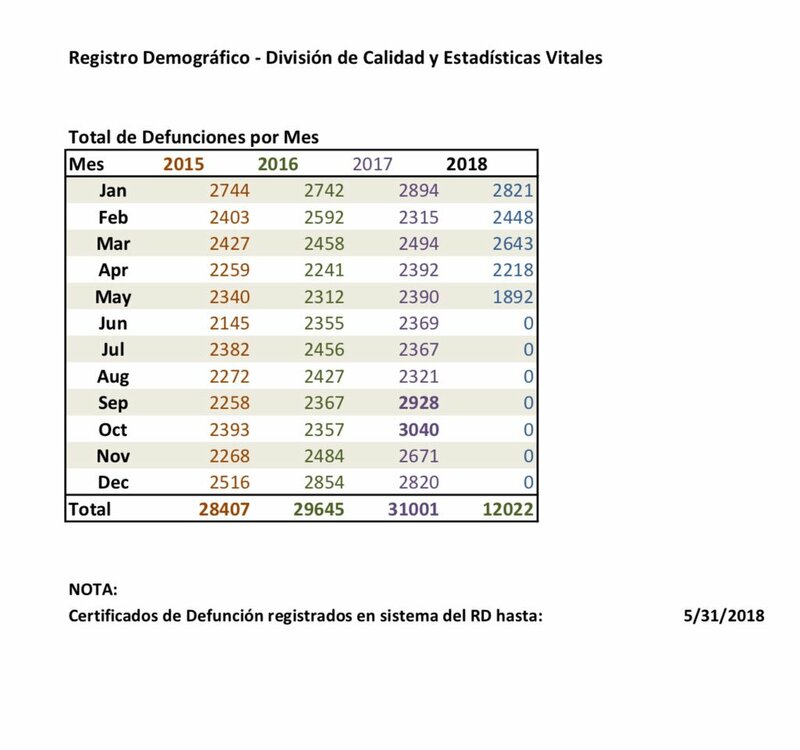 BREAKING: the Puerto Rico Health Department has buckled under pressure and released the number of deaths for each month, thru May of 2018. In September 2017, when Hurricane Maria made landfall, there was a notable spike, followed by an even larger one in October. Last edited by campbell; 06-04-2018 at 02:18 PM.. The Financial Oversight and Management Board for Puerto Rico on Thursday recertified a fiscal plan for the commonwealth after reaching an understanding with Gov. Ricardo Rossello. Pension reforms sought by the oversight board remain in the fiscal plan, despite the governor's objections. The plan calls for freezing pension benefit accruals by July 1, 2019, and enrolling all employees in defined contribution plans, as well as Social Security. Benefits would be reduced progressively to an average cut of 10%, with no cuts for participants whose combined pension and Social Security benefits are below the poverty level of $1,000 per month. The pension reforms are expected to be included in a plan of adjustment to be confirmed by the court overseeing Puerto Rico's bankruptcy proceedings. Mr. Rossello did agree to labor reforms in the fiscal plan, including making Puerto Rico an "at-will employment" jurisdiction for current and new employees. Those changes will require action by the Puerto Rico Legislature. Other changes in the recertified plan include new investment priorities aimed at promoting economic development, such as a public-private partnership initiative and a critical infrastructure office. Oversight board chairman Jose B. Carrion III said in a statement that the fiscal and structural reforms "will help return growth to our island's economy." A federal judge has refused to absolve the U.S. government of liability for investors’ losses on Puerto Rico bonds, a potential blow to efforts to write down the U.S. territory’s $73 billion debt load. The ruling issued Friday by Judge Susan G. Braden of the U.S. Court of Federal Claims is an incremental victory for hedge funds fighting to get repaid on the $3 billion in Puerto Rico pension bonds These creditors have targeted the U.S. directly, saying the federal government should make them whole for enacting a 2016 law that set them up for losses. The lawsuit strikes at the heart of the rescue law, known as Promesa, designed to tackle the U.S. territory’s fiscal crisis. Promesa was designed to avoid a taxpayer bailout of Puerto Rico, creating a court-supervised process for wringing debt reductions from creditors instead. The legislation, passed by a Republican Congress and signed by President Barack Obama in 2016, also installed an federal board to oversee Puerto Rico’s finances and, if necessary, drive down the debt through the courts. The oversight board placed the territorial government and some public agencies under bankruptcy protection last year and has been wrangling with creditors since over repayment terms. Puerto Rico’s Employees Retirement System entered court protection to restructure its obligations to bondholders and retirees. The retirement system had sold $3 billion in debt in 2008 to keep itself afloat and buy time for its investment portfolio to grow. Proceeds from the issuance were supposed to help the pension system continue paying benefits until elderly pensioners died off and younger public employees began retiring with leaner benefit packages. Bondholders were assured they would be repaid ahead of retirees from Puerto Rico’s employer contributions to the pension fund. But the investment portfolio earned less on its investments than the interest it had to pay on the bonds, accelerating the pension system’s collapse into insolvency. After Promesa was enacted, contributions to the system were moved out of creditors’ grasp. Oaktree Capital Management LP and other bondholders sued in the Court of Federal Claims, the tribunal that handles compensation demands against the U.S. Bondholders have been suing Puerto Rico and the oversight board since 2016 over an escalating series of debt defaults. But the Oaktree-led creditors were the first group that sought to put U.S. taxpayers on the hook. Judge Braden’s decision characterized the oversight board as a creature of the federal government, contradicting the judge presiding over Puerto Rico’s restructuring, who earlier Friday said the board was a local entity. Both the bondholders and the Justice Department declined to comment. Judge Braden also stayed the case pending the outcome of a separate constitutional challenge to the installation of the oversight board. Creditors would need to show their property rights were violated before she could award any compensation from taxpayers. Was the Detroit bankruptcy a turning point in the municipal bond market? For years, bond investors snatched up debt issued by the Puerto Rican government, even as the island's economic and fiscal situation deteriorated. What's more, bond yields never rose high enough to reflect the risk Puerto Rico clearly displayed (http://www.marketwatch.com/story/why...ebt-2017-10-04). Many investors are now suffering. A 2009 Puerto Rico general obligation bond traded last month at 42 cents on the dollar. A new academic paper suggests those market conditions may not have been as off-base as they look now, in the aftermath of a debt default, the creation of an oversight board, and bitter battles between bondholders, government officials, bond insurers, and many other counterparties. Rather, investors may have been justified in continuing to buy what even then seemed like sketchy debt at relatively tame interest rates because they were bolstered by a belief that in a worst-case scenario, the U.S. Treasury would bail them out. The paper (https://www.brookings.edu/wp-content...nko-et-al..pdf), from a University of Illinois at Chicago team led by Professor Bob Chirinko, suggests that for investors to keep buying debt issued by an entity in a " dire fiscal and economic situation," there must have been what the researchers term a "Treasury put." A put is an option investment that allows -- but does not oblige -- the bearer to sell the security back to another entity at a specified price and time. In this case, that buyer, in the minds of investors, would have been the U.S. Treasury. There was plenty of precedent for the federal government to step in to protect investors. The most relevant example for the municipal bond market may have been in 1975, when New York City, on the brink of running out of cash, got emergency loans from Washington that had been initially refused. The bailouts of automakers and financial institutions in 2008, and ongoing debt restructurings like the one in Greece, reinforced the idea that policymakers would usually step in to aid investors if the need was great enough. But things changed. As the researchers put it, the Treasury put was "extinguished" in a "seismic shock" in 2013, when the city of Detroit filed for bankruptcy. The Obama administration refused formal assistance for the city, even though its mayor reminded Washington that federal dollars and resources had been found for the automakers that had once powered Detroit's economy. In fact, Washington lawmakers took pains to make sure U.S. taxpayers wouldn't be responsible for state and local fiscal distress, including introducing legislation in July 2013 that would specifically exempt federal responsibility for local pension liabilities. Suddenly, the Puerto Rico investment thesis looked a lot different, the researchers note. And if it wasn't glaringly obvious to the bond market, entities like Morningstar made it clear, writing, "given the current political climate in Washington, D.C., we also think it is unlikely that the federal government will offer any sort of financial bailout for Puerto Rico." The chart below shows Puerto Rico bond prices before and after the Detroit bankruptcy, which is portrayed by the dark red vertical line. But as acknowledged by the researchers, and expanded on by some of the audience members reacting to the presentation of their paper at the Brookings Institution Tuesday (https://www.brookings.edu/events/7th...cipal-finance- conference/), there are a lot of variables that influenced the complicated situation in Puerto Rico, not just an assumed bailout. Among the most important may have been that most municipalities have the ability to file for Chapter 9 bankruptcy, as Detroit did. Puerto Rico, as a U.S. territory, does not -- the restructuring it is pursuing now is ad hoc. Several audience members also noted that Puerto Rico bonds may have simply fallen into one or another category common to dubious investments, such as the "greater fool" theory. Alternately, some investors may have already put so much money into Puerto Rico that they saw no way forward but to double down on that investment thesis. Still others may have thought that yields had finally started to creep high enough that even if they had to take a haircut, their total return would still be positive. For all those reasons, it's hard to pinpoint the exact contribution of a "Treasury put" to keeping Puerto Rican bond yields so out of line with what turned out to be very real, and very obvious, risk. Still, the researchers try to quantify how much of a premium a perceived Treasury backstop gives to other troubled, if not distressed, municipalities, such as Illinois, New Jersey, and Kentucky. the U.S. Treasury. The rational investor model rules out the former hypothesis. the Detroit bankruptcy and bracketed by the risk premia on Corporate Aaa and Baa bonds. existence of a sizeable Treasury Put and a significant misallocation of capital to Puerto Rico. Why didn’t investors demand higher yields for buying Puerto Rican government bonds? Editor's Note: This paper will be presented at the 2018 Municipal Finance Conference on July 16 & 17, 2018. The conference is a collaboration of the Brookings Institution’s Hutchins Center on Fiscal and Monetary Policy, the Brandeis International Business School’s Rosenberg Institute of Public Finance, Washington University in St. Louis’s Olin Business School, and the University of Chicago’s Harris Institute of Public Policy. It aims to bring together academics, practitioners, issuers, and regulators to discuss recent research on municipal capital markets and state and local fiscal issues. For years, Puerto Rico’s economic and fiscal picture was deteriorating. Between 2005 and 2013, real GDP declined by 15 percent, while between 2000 and 2015 Puerto Rico’s government liabilities to GDP grew from 70 percent to 109 percent. Nevertheless, investors continued to purchase millions of dollars of Puerto Rico’s bonds with only a modest risk premium. In a paper to be presented at the 2018 Municipal Finance Conference, “What Went Wrong? The Puerto Rican Debt Crisis and the ‘Treasury Put,’” three economists from the University of Illinois at Chicago ask why investors were so willing to continue to lend to Puerto Rico. Their answer: investors assumed the federal government would ultimately bail out Puerto Rico. That expectation was shattered in July 2013 when the federal government refused to bail out Detroit, which had filed for bankruptcy. Although no new bonds were issued by Puerto Rico after this so-called “seismic event,” the authors estimate the risk premium on the bonds by tracking the divergence in market prices on the uninsured and insured bonds – and find it rose substantially. For instance, in May 2013, two months before the Detroit bankruptcy, the authors estimate the average risk premium on Puerto Rican bonds at 2.56 percentage points. Two months after Detroit’s filing, the average risk premium was at 4.23 percentage points. In short, the authors estimate that investors’ pre-Detroit expectations that the federal government would bail out Puerto Rico reduced the interest rate that Puerto Rico paid to borrow by 3.5 percentage points. The paper concludes that financial markets failed to limit the flow of capital to Puerto Rico, resulting in a misallocation of capital, because of the Treasury Put, and argue that the government should seek ways to eliminate this sort of implicit guarantee while providing a safety net to protect citizens from harm. This, they acknowledge, may reflect the “Gordian Knot connecting unfettered markets, restrictive policies, and political interests,” making it challenging for any democracy to resolve. Investment firms and funds holding $2 billion of bonds issued by Puerto Rico’s Employees Retirement System on Tuesday sought a court order that would allow them to try to enforce an agreement safeguarding collateral set aside for interest payments. The bondholders in court papers filed in U.S. District Court in San Juan argued for an order lifting the stay in the U.S. territory’s bankruptcy-like restructuring case so they could sue the retirement system for breaking a deal that provided for interest payments on the bonds from a dedicated account.